Chicken Sausage and Sweet Potato Hash with Baked Eggs. 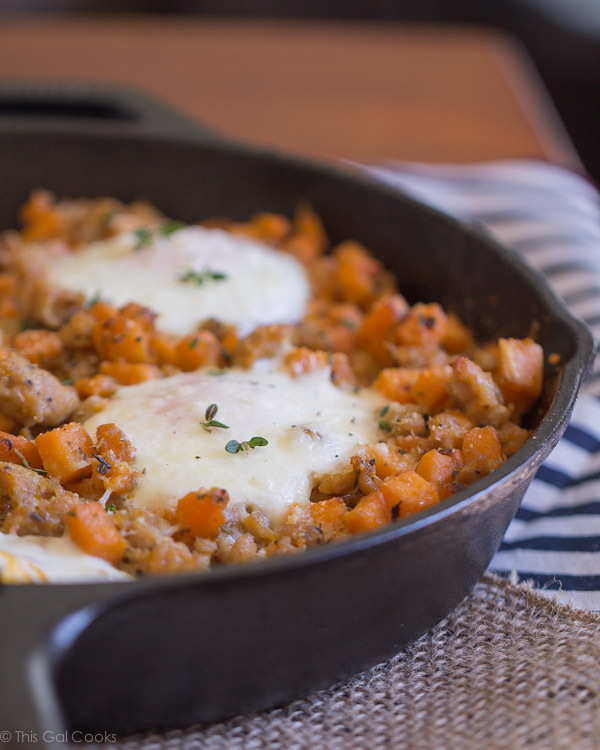 A savory one skillet breakfast dish made with mild Italian chicken sausage, fresh sweet potatoes and parmesan cheese. Around 350 calories per serving. One potato, two potato, three potato, four, give me a sweet potato and maybe a little more. 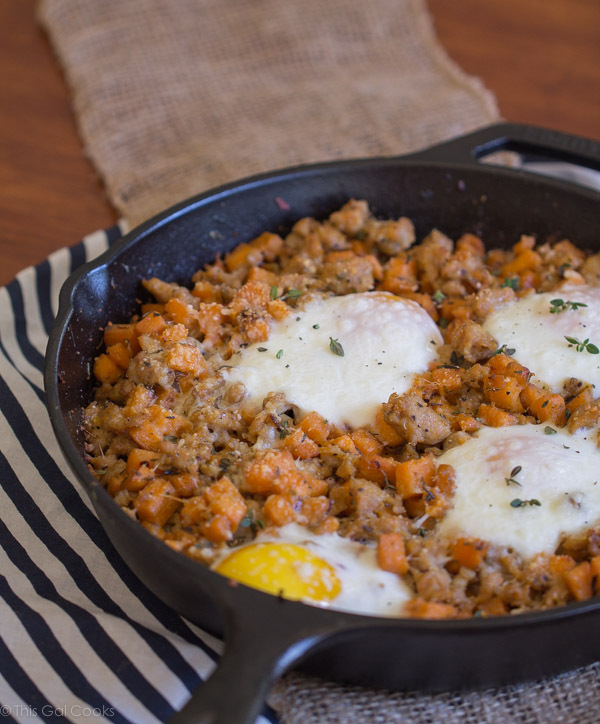 A little more of this Chicken Sausage and Sweet Potato Hash with Baked Eggs. This stuff is good! Like fork lickin’, plate scrapin’ mouth waterin’ good. A while back my good friend Deb from Cooking on the Front Burner had a rad little giveaway on her blog. Penzy’s Spices and Herbs. Have you ever heard of them? I had not until I stumbled upon them on Deb’s blog. So at first I was like “those look good.” And then I was like “I’ll enter Deb’s giveaway.” You all know what happened next… I won the giveaway. Of course, I had to make something with them right away once they were delivered to my doorstep. I already had this awesome idea swimming around in my head for a breakfast recipe. Perfect timing for the arrival of those herbs. I’m a huge breakfast lovin’ gal. One of my favorite things to do on the weekend is make a tasty breakfast for Ken and I to enjoy. This Breakfast Egg Bake Casserole and these Blueberry Coconut Pancakes are a few of my favs. I used mild Italian chicken sausage in this recipe, which cuts down on the fat content A LOT when you compare it to using regular pork sausage. Be sure to pick up a good quality chicken sausage. You’ll thank yourself when it comes to flavor. I used Publix Greenwise Mild Italian Chicken Sausage, which is a pretty darn good quality chicken sausage! In a cast iron skillet over medium heat, cook the chicken sausage until browned. Break up the sausage while it is cooking so it becomes crumbly. Remove form the skillet and set aside. Whisk together the spices and toss with the diced potatoes. Add the olive oil and mix well. Place the potatoes in the cast iron skillet and cook on medium to medium high heat until tender. If they begin to start drying out or sticking to the pan, add a little more olive oil to the pan. I did cover the potatoes for a few minutes so they would cook faster. Once the potatoes are done cooking, mix in the chicken sausage. Crack the eggs over the top of the potato/sausage mixture and then sprinkle with parmesan cheese. Bake at 350 for 15 minutes. If you want firmer eggs, cook a little longer. Remove from the oven and garnish with fresh thyme. So…are you ready for breakfast now? Ooh, I just made hash recently and it was divine! I especially love your sweet potato version Julie! Isn’t it fun when you win giveaways! 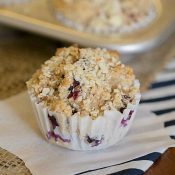 This looks perfect for a weekend breakfast! Breakfast is my favorite meal of the day, and I’m always up to try new stuff, so I’m eager to give this hash a try. 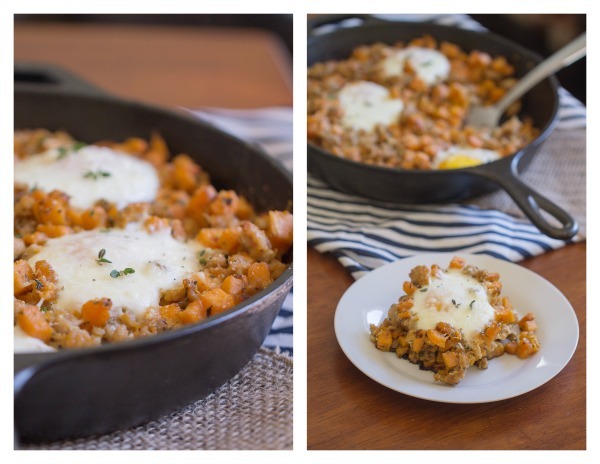 Seriously – sweet potatoes + chicken sausage? Heaven. And do I get a runny yolk too? I’m sold. YAY! Glad you are enjoying the spices and created this tasty recipe! This is one dish I know John would love for me to make him and I think I have all those spices too :-) Pinned. I love sweet potato hash! It is one of my favorites for breakfast. 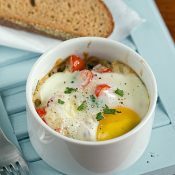 I’ve never tried it with baked eggs, but need to do that soon! Good one! I love a good hash! And I told you Penzeys is the bomb!! This really does look to die for, especially with the sprinkle of parmesan on top … your hubby is one lucky chappy! I cooked a dish with some chicken sausages a week or so back and really enjoyed them, so maybe I should go for it again with this! Will have to make it on the stove top then! Currently traveling through Slovenia and unfortunately have not seen any sweet potatoes around here so it’ll have to wait : (( I’d love to share this post and the portobello post on my blog in a post where I share my favorite recipes of the week. Would it be ok to grab a photo from both posts (with links back to your posts of course)? Let me know! 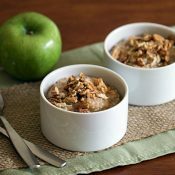 This would be great for breakfast or for dinner. Yumm! I could eat this everyday! Thanks for linkin’ up with What’s Cookin’ Wednesday! This sounds like a perfect breakfast for me! Thanks for sharing! Looks yummy! Thank you for sharing with us at #HomeMattersParty . We would love to see you again next week. This looks so delicious. 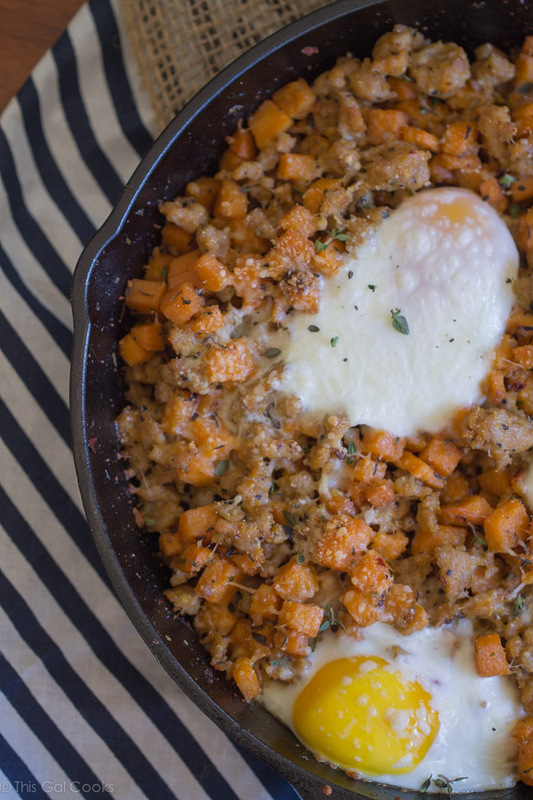 I love sweet potatoes and eggs and would be a great meal anything. Thank you for sharing at Dishing it and Digging link party. 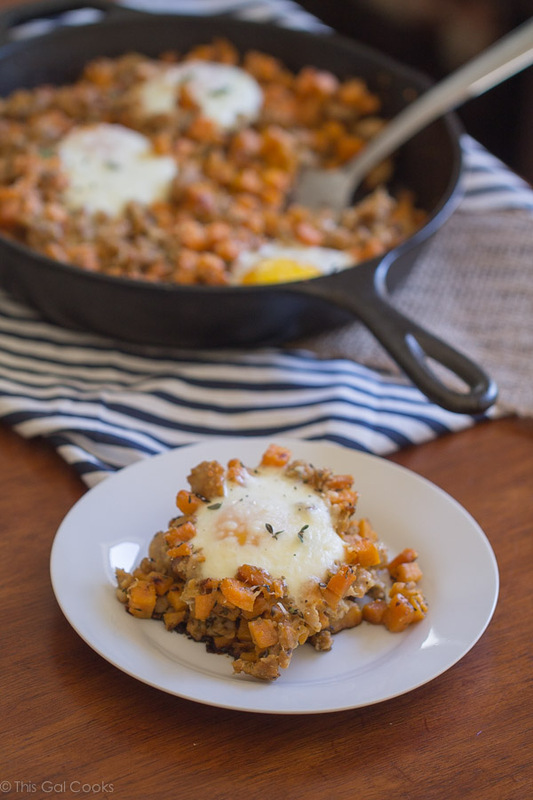 We will love your Sausage Sweet Potato Hash and Baked Eggs looks fantastic! Hope you are having a great day and thanks so much for sharing you awesome post with us at Full Plate Thursday. Oh it looks divine! Will have to try that out this weekend. Thanks for the recipe!